An extraneous “N” inserted into the English translation of The Legend of Zelda in 1987 has finally been removed, and it only took 29 and a half years. This actually happened a few months back, because it’s in the version of Zelda included on the NES Classic Edition. But I didn’t even notice until Clyde Mandelin, author of the book Legends of Localization Book 1: The Legend of Zelda, pointed it out on Twitter yesterday. As Mandelin alludes to in the tweet, Nintendo has had multiple opportunities to delete this “N” over the decades, beginning with the re-release of Zelda in a collection for the GameCube. It actually did tweak the translation in spots for this version, but missed this one. 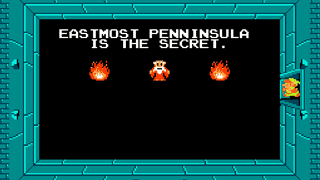 “Penninsula” stuck around for the Wii, 3DS, and Wii U Virtual Console versions, too. Finally, you can enjoy Zelda with the correct number of Ns, if you buy an NES Classic. Which is easier said than done, of course.